A small city best known for its spectacular springtime carnival, the Basler Fasnacht, which has grown to be one of the biggest crowd-pullers in the whole of Switzerland, Basel is perhaps best visited during the gorgeous summer months. At this time of the year, Basel enjoys some of the country's sunniest weather, in spite of its somewhat northerly situation. There are plenty of excellent ways to cool off in the summer and numerous visitors to Basel choose to relax onboard a boat trip along the River Rhine (Rhein), enjoying the views and the gentle breezes. Trade fairs have long been a major draw card in Basel and many take place in the latter part of the year, attracting crowds of thousands. 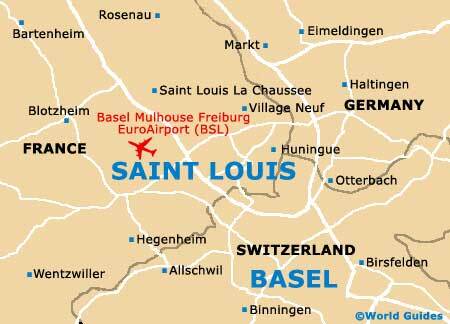 Basel enjoys a rather unusual setting, being extremely close to both the borders of France and Germany. 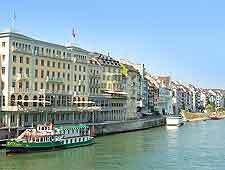 For the latest in tourism advice for all these regions, and the city's main districts of Vieille Ville (Old Town), Grossbasel and Kleinbasel, pay a visit to the Basel Tourist Information centres at either the Schifflände or the SBB Bahnhof (train centre). When visiting the tourist offices, try to pick up your copy of the 'Experiencing Basel' booklet. This clearly details a number of walks around the town centre, all of which start from the Market Square (Marktplatz), next to the rather eye-catching bright-red Town Hall (Rathaus). Tourists will find plenty to keep them occupied during their Swiss holiday, with a family favourite being Basel Zoo, a historic zoo dating back to the 1870s and home to many exotic animals from Africa. Native wildlife can be enjoyed at the Tierpark Langen Erlen, and horticulture at the Botanical Gardens (Botanischer Garten Brüglingen), while various concerts regularly are held at the Stadtcasino Basel, Scala Theatre and at the St. Jakob Arena, which is located within St. Jakob's Park and can accommodate audiences of more than 6,000 spectators, also hosting regular ice hockey matches. 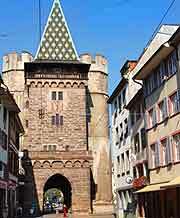 More information about Basel Tourist Attractions. Spend time taking a stroll in the city, starting at Market Square (Marktplatz) and passing attractions, such as the vivid red Town Hall (Rathaus), or the magnificent cathedral known as the Basler Münster, which presides over the Münsterplatz. Also check out the splendid Fischmarktbrunnen fountain on the Fish Market Square (Fischmarkt), and the Gate of Spalen (Spalentor), with is part of the city's medieval city walls and boasts a large portcullis. More information about Basel Landmarks. For something quite different, spend an afternoon or two at some of the best museums. Around eight million natural history exhibits are on display at the Naturhistorisches Museum in Old Town Basel, while nearby, the Museum der Kulturen (Cultural Museum) is now the biggest of its kind in Switzerland. All ages will enjoy looking at the large collection of historic toys at the Spielzeugmuseum, or take pleasure in the world's most extensive collection of Greek and Roman casts at the Skulpturhalle. For the best in art, visit both the Kunsthalle Basel (Art Hall) and Kunstmuseum Basel (Museum of Art), where you can appreciate works by famous artists, such as Leger and Picasso. 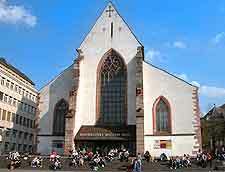 More information about Basel Museums and Basel Art Galleries. Well positioned for numerous interesting day trips around Switzerland, Basel is close to the capital city of Berne, where one of Europe's longest shopping parades is located. 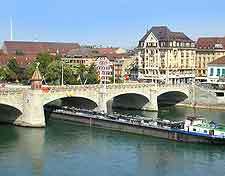 Also nearby are the ancient city walls within Lucerne, and the banking city of Zurich, which is based around the River Limmat. 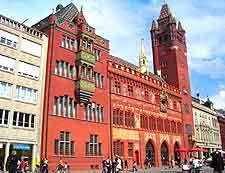 However, being so close to France, many tourists from Basel choose to visit nearby Mulhouse, a charming town in Alsace, where highlights include the Musée National de l'Automobile and its hundreds of unusual vehicles. More information about Basel Attractions Nearby.